ATN NVMPAN1430 NVM14-3 Night Vision Monocular FREE SHIPPING! The ATN NVM14-3 Night Vision Monocular is an extremely versatile design intended to provide superior visibility for all activities during low-light conditions. The monocular can be head or helmet-mounted, attached to a firearm alongside an IR laser or used as a handheld night vision device. Its third-generation intensifier tube and premium optics provide a clear, high-resolution image, while its automatic brightness adjustment system ensures constant image brightness despite fluctuating levels of ambient lighting. The Automatic Protective System shuts off the device after ten seconds of exposure to too-bright light in order to protect the intensifier as well as operators. 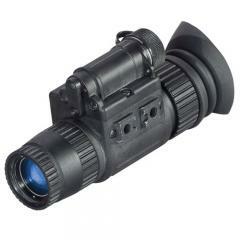 Bright LEDs located in the viewfinder indicate IR operation, low battery status and excessive brightness levels, allowing for constant device updates while in use. ©2002-2019 CopsPlus.com: ATN NVMPAN1430 NVM14-3 Night Vision Monocular FREE SHIPPING!